Lean Change Management — What is the Secret Sauce? 1 Lean Change Management — What is the Secret Sauce? 1.1 Do We Need a Different Organisational Change Management? Reading Time: 11 minutes Lean Change Management is based on the metaphor that any change initiative can be thought of as a startup. People affected by change become involved and accountable by co-creating the change. Short and closed feedback loops transfer the reaction of the people involved to continuously adapt the course of change. Borrowing many principles and techniques from the Lean Startup method (Eric Ries) and Lean Stack Machine (Ash Maurya), change agents are able to keep the change plan and model up-to-date by incorporating the latest learnings obtained from the reactions on the work floors. Do We Need a Different Organisational Change Management? What are the characteristics of these approaches and why do they imply these weaknesses? Here is a list of in my opinion the most relevant ones (the order does not imply any prioritisation). Change is often run as a Blame Game. — The traditional approaches are “deficit-based”: they identify problems, they analyze what’s wrong and how to fix it, they plan, and then take corrective actions. But change is not necessarily corrective. Change is adaptive. Insufficient Involvement of the People Affected. — Any change story told by change leaders has to cover all aspects to motivate the workforce. However, there is has much more impact, to let the employees tell the story. Treat people as Adults! Traditional Change is rolled out in a Big-Bang approach. — Conventional change approaches often start from a pre-existing change solution based on a particular problem set and business domain requirements typically specified by the executives of the organisation. The change itself is implemented by a Big Bang roll-out, using upfront design, and static plans. Change is Disruptive. — Change can have a tremendous effect on the person asking to change. Change always disrupts the status quo. Change has no Start and End Points. — Traditional change initiatives realise change as a kind of project with particular start and endpoints. They are plan-driven and revolutionary: at their end is the final roll-out (big bang). They assume change can be controlled and managed with upfront planning. However, change never stops. Change is continuous. Change is evolution. Change is life. Paradox of Change. — The less mature an organisation is, the deeper its performance drop will be once the change starts. Paradoxically, the less mature the organisation is, the less tolerant the organisation will be for this performance drop. This “paradox of change” almost guarantees that any organisation that requires a Big Change will not be able to successfully execute this change and will end in suboptimal outcomes. For more details on this topic see my blog post "Pitfalls of traditional organisational change management". There is an alternative: Lean Change Management. Jeff Anderson and Alexis Hui (both Deloitte LEAN) started Lean Change Management in 2010 as an antithesis to the conventional change management approaches. In 2012, Jason Little joined the Lean Change community and published his variant of the framework. Today, Jason's approach is prominent and dominates the discussion. Lean Change Management is an iterative and incremental, evolutionary, and empirical method for organisational change management. Lean Change Management is based on the metaphor that any change initiative can be thought of as a startup. — See the section on Experiments. People affected by change become involved and accountable by co-creating the change. — See the section on Negotiated Change. Short and closed feedback loops transfer the reaction of the people involved to continuously adapt the course of change. Borrowing many principles and techniques from the Lean Startup method (Eric Ries 2011) and Lean Stack Machine (Ash Maurya 2012). Change agents are able to keep the change plan and model up-to-date by incorporating the latest learnings obtained from the reactions on the work floors. — See the section on Validated Learning. Lean Change Management is based on the following principles. People and organistions are complex, adaptive, non-deterministic systems. You can't control them. You can only guess and assume how the system may react and adapt to change. Focus on people's reaction to change, rather than manage the change. Lean Change Management is feedback-driven, not plan-driven. Have a big picture — vision, idea, plan. And deliver change in small batches only. — Think small. Lean change managemenet is an evolutionary approach, rather than of the revolutionary big-bang of conventional planned change roll-outs. Run experiments instead performing change activities. Co-create change with the people affected, not consult them in the change. Lean change focuses on enabling learning through speed and self-organisation, rather than on efficiency through specialisation and command-n-control. Lean Change Management extends the Kotter change model with the Build–Measure–Learn cycle of lean thinking. This allows change agents to take advantage of concepts like feedback, continuous improvement, pivoting change and validated learning. 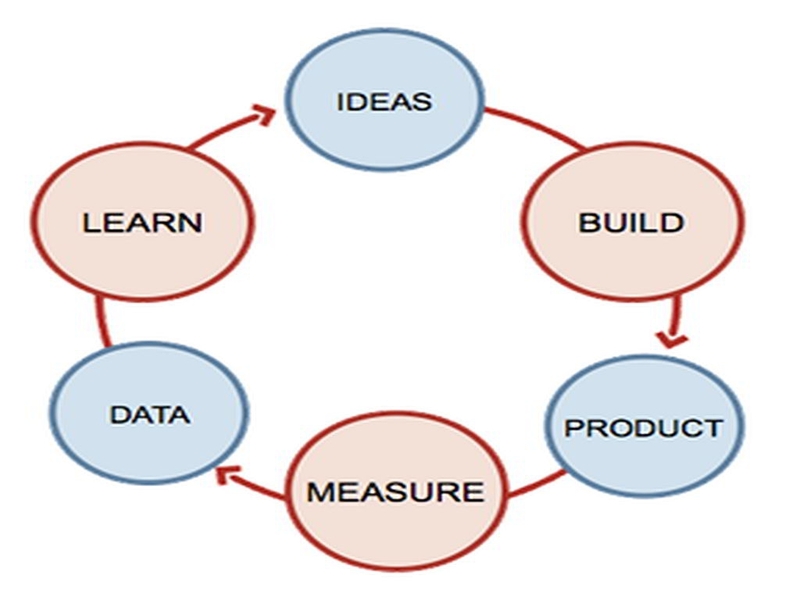 The Lean Change Management cycle consists of two loops. In the main loop, we gather insights about the needs to change, potential options to apply the change (application areas and the change recipients, i.e. people who change). And we set up to roll out smallest increments of possible changes that will enable learning to understand the viability of the change, so-called Minimum Viable Changes (MVC). In the sub-loop we negotiate the MVC (change impact) with the selected target group, we create and develop the change, we probe it and we get further insights by continuous learning and measuring success or failure. The sub-loop we might run through multiple times up to a (pre-)defined limit. In reviewing our data, we decide about success or flop, about continuing, stopping or pivoting the change. Insights. – Understand the problem space (what is the problem, what is the problem of the problem; who benefits from change). Build hypotheses due to subject interpretation. Options. – Identify areas of potential changes, based on the hypotheses; clustered by effort-value ratio. Minimum Viable Change (MVC) / Experiments. – Generate from options the smallest applicable change, MVC. Perturb the organisation by running the MVC as an experiment and validate/falsify your hypothesis. Prepare. – This is the planning stage of your Experiment. Slice the MVC in as small as possible but still working parts. Build a hypothesis for start/end state. Define measures for the end state. Introduce. – Implement a part of the MVC. You start working with people affected by the change. Review. – Validate and adjust the hypothesis by the measurement results. Here you review the outcomes of the Experiment. Normally you do this after the amount of time you thought you would need for the change to stick. Repeat the sub-loop until the MVC is completely implemented. Start the Lean Change Cycle next round with the new insights. Negotiated Change is a central concept in Jeff Anderson's Lean Change Management. If the organisation communicates the need for change properly – addressing the Why? and the different levels of impact the change might have – change agents can then negotiate various dimensions of a change with the people being affected. By negotiating about impact, measurements, ways to realisation, and success criteria of the change, the recipients of any change become co-authors and co-implementers of all aspects of the change. Negotiated Change transforms change recipients to change co-creators. Those that feel that their intentions are heard become over time true change participants and change owners. These empowered people will keep the change initiative on track. In Lean Change Management there is no equivalent to a traditional roll-out procedure for change. Since the change implementation is always designed for a specific field of application (department, team, group) we can not easily "carry it over" to new, or even similar, application. However, progress can be measured and communicated by the short-term wins. It is the imperative of the organisation to communicate and to celebrate any wins that result from successful change implementation. Spread the news about the success and people from other areas will come to adapt your change in their domain. Empowered people will act by themselves, but it is the mandate of the organisation to support them in their new adaption. 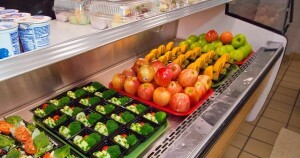 Thus, by adapting there is a self-promoting kind of roll-out. Validated learning is a core concept in the Lean Startup method.3 In Lean Change Management validated learning is the progress made when assumptions have been confirmed or rejected by subjecting each assumption to change participants experiments. In Lean Change validated learning had to come from all people affected by the change, not the change agents only. Validated learning can't happen without successfully implemented negotiated change, i.e. the change recipients co-create the change. 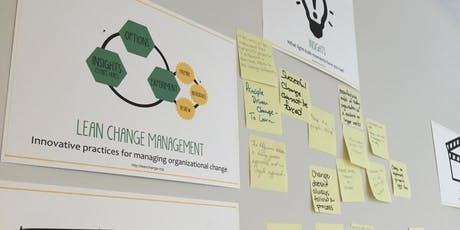 Lean Change Management advocates that any change plan has to be described as a set of assumptions and that the change agents, change stakeholders and change recipients are responsible for validating those assumptions using explicit hypotheses. Validated learning is learning from data measured in experiments. It supports the notion of deliberate change planning without falling into the trap of fixed upfront design. Validated learning is an empirical approach. It is evolutionary. By this, organisational leaders can implement a deliberate change, without locking them into a particular approach upfront. Neither is a Minimum Viable Change (MVC) the final change with all the features full-fledged implemented. Nor does minimum implies small, little, tiny. – However, it may take some time to develop an MVC before you can probe it. The MVC is the change with the highest return on investment versus risk. It has just those core features that allow the change to be deployed and to be used by the selected target group and nothing more. A Minimum Viable Change (MVC) is the smallest possible change that will enable learning necessary to understand the viability of the overall change program. Stripping down target options to one or two interrelated topics. Focusing on the needs of a smaller group of highly integrated change participants. Reducing the scale of anticipated benefits to something tangible and pragmatic. Constraining the required commitments to how much time change participants actually have the capacity for (often less than you want or think). Focusing on countermeasures for one core problem listed in the urgency section. Limiting external change agent actions to one explicit tactic (i.e. coaching only). Keeping the duration of the entire change to less than one month. Limiting the number of improvement experiments for the change to less than eight. 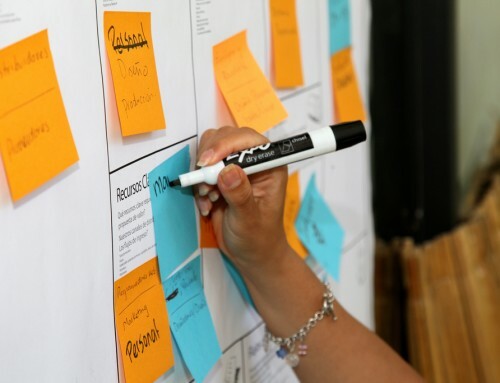 Proven methods for proper slicing are Impact Mapping and User Story Mapping. Instead of long-planned, big rollouts, Lean Change Management insists of small interventions to probe particular hypotheses about the potential change instantly. "If we do X, we expect the result Y having the impact Z"
Develop a proving test environment for the hypothesis. Run the experiment for a certain time frame. Measure and collect data from running tests. Learn by interpreting the data. Rephrase the hypothesis and start a new experiment, if needed. Implement the change by improvement experiments to validate that the change is viable. Since by Systems thinking organisations, departments, and teams are adaptive systems, any experiment successfully adopted will itself change the system. This new landscape provides us with the canvas to further experiment. Nudging and Culture Hacking are two cornerstones to run experiments.4 The basic concept of “Nudging” is that a relatively subtle policy shift – the “nudge” – encourages people to make decisions that are in their broader self-interest. A nudge makes it more likely that an individual will make a particular choice, or behave in a particular way, by altering the environment so that automatic cognitive processes are triggered to favour the desired outcome. A culture hack is a small change exploiting a single area where your culture is vulnerable to change. Cultural hacks are small, emotional, immediate changes having big impacts. They are not quick fixes for "cultural deficiencies". It’s more about focusing on small things more frequently rather than only trying to tackle and change the big things. Nudging theory became prominent with the 2008 publication of Nudge: Improving Decisions About Health, Wealth, and Happiness by Cass R. Sunstein and 2017 Nobel Laureate Richard H. Thaler. The following examples illustrate the idea of nudging. The urinal flies at Schiphol airport. – In 1970, the administration of Amsterdam airport Schiphol was shocked by the cleaning costs of the urinals. Fake flies were drawn near the drainage holes in airport urinals. The results were once again shocking: spillage on the bathroom floor was reduced by 80%. As Thaler explained, the reason is that men like to aim at things, so having a target to immobilize would be “fun”. Thus, the urinal flies encouraged men to be more accurate while in the bathroom — an exemplary case of the ability for nudges to engage people on a subconscious level. 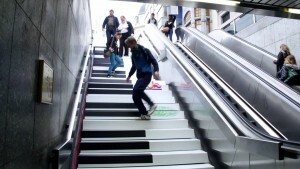 The piano stairs at a subway station installed by VW and Swedish advertising agency DDB Stockholm. – To encourage people to take the staircase instead of the escalator, a set of steps at the Odenplan subway station in Stockholm were converted into working piano keys. Culture Hacking integrates from Systems Thinking the idea, that organisations are adaptive systems, and from computer hacking that every system can be hacked. In analogy of the operating systems of computers, organisational culture is the operating systems of companies, firms, and other social organisations. Essential is that culture hacks are small interventions to tackle a problem the culture has. "Culture hacks are discrete, counter-cultural interventions aimed at changing how people interact with each other. When they work, they can have a big impact. When they don't — no big deal, we can try something else." "Culture hacks are easy — you should be able to design and carry them out in 48 hours." — Kristin Moyer, Gartner VP. You can use culture hacks in Lean Change Management to expose an organisation’s dysfunction to itself. It’s a great, and visual, way to prioritise the Options in the Lean Change Cycle. And, secondly, it is a strong metaphor for each change agent. For more details read my separate blog posts on Nudging and Culture Hacking. Alexis Hui: Lean Change. Enabling Agile Transformation using Lean Startup Principles. Agile2013 Conference. Jason Little: Lean Change Management: Innovative Practices For Managing organisational Change. Happy Melly Express, 2014. Jason Little: Combining Innovation Games And Lean Change Management. Michael Tarnowski: Lean change canvas. How to deliver change best. Plays-in-Business.com, 2015. Michael Tarnowski: Lean Stack and Lean Canvas — Challenge your Business with Experiments. Plays-in-Business.com, 2015. Youtube-Video: What is Lean Change Management? Luis Goncalves: Lean Change Management Model. 2018. Thaler, Richard H., and Cass R. Sunstein. Nudge: Improving Decisions about Health, Wealth, and Happiness. New Haven, CT: Yale UP, 2008. Ash Maurya: Running Lean. Iterate from Plan A to a Plan That Works. O'Reilly and Associates, 2012. Eric Ries: The Lean Startup: How Today's Entrepreneurs Use Continuous Innovation to Create Radically Successful Businesses. Crown Business, 2011.
: Jason Little • Frank Van De Ven, via Medium.com • U.S. Department of Agriculture via flickr.com • Maverick, . For more details see Carolyn Aiken, Scott Keller: The irrational side of change management. McKinsey Quarterly, April 2009. Google showed in their famous two studies Project Aristotle and Project Oxygen how important psychological safety is for team effectiveness as well in motivational alignment at the team and at the management level. At the same time, these studies showed how team effectiveness differ tremendously in Google company culture style from traditional business school thinking.